For the last four days we had a little glimpse into life with Grandparents on the doorstep. A little tease at the benefits, the most obvious being childcare - we saved £44 in just two days with their presence on the school run thus avoiding breakfast and after school clubs. We, that's me and the husband, actually managed a night out at the pub together. Which was lovely. Despite the 24 hours I needed the next day to recuperate but hey, the Grandparents were here! Unfortunately, this is a luxury for us and we see little of the Grandparents due to a combination of distance - Norfolk is pushing it for childcare and France is just taking the p***. They are clearly not local so we don't get the help and support that often. Sometimes this gets me down. But, I've been thinking and I may have an answer. Well, a financial one. I have a suggestion for our trusted politicians. I haven't put much thought into the logistics and fairness of it but I think that's how politics works. If you have no Grandparents in a 30 mile radius of your home then you are entitled to a tax break to compensate your childcare outgoings as a result of the Grandparents not being able to help out. To fund this all you lucky souls with Grandparents on the doorstep get taxed more! I'm sure there are some flaws and it clearly doesn't make up for the emotional crap of not having family nearby but it could soften the blow. What do you think? Could this work?! Fab idea!!! My two have only ever had one Grandparent and he works more than full time hours owning a busy building company. I often thought of adopting some for the kids, not as sitters honest (!) 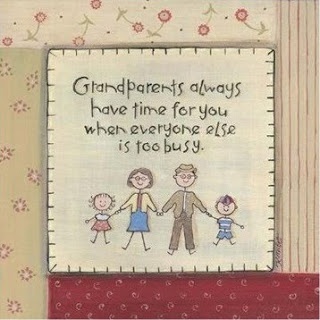 but to share the stuff Grandparents are so good at that we never get around to. Thank you! Yes, a rent-a-granny business is what we need! totally fair, am so with you on this one - lets march on the party conferences tomorrow! Yes! We don't have any family near by and I get very jealous of my friends who have been able to go back to work as grandparents have helped out with childcare and school runs. Yes, I get that feeling too also when the neighbour's grandchildren are dropped next door every weekend. Would love to do that! As someone without grandparents nearby I would love this. But can I make one amendment. My FIL lives 100 miles away, so he's not much use with childcare, but then he's also 88 years old so if he lived next door he'd still be no use for childcare. You have to have grandparents in a 30 mile radius who are capable of looking after the kids. I will amend my policy. Good point raised!